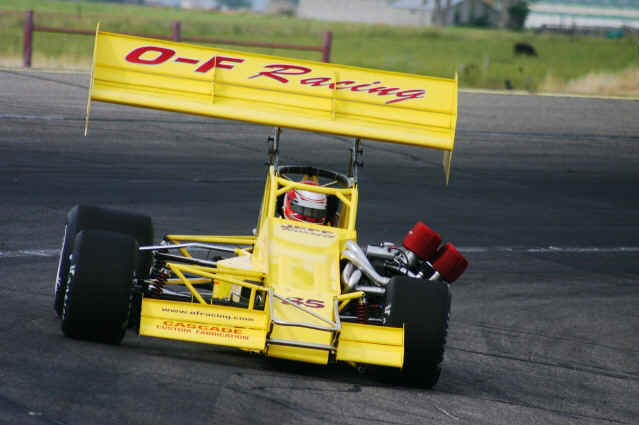 Out Front Racings Best Year! If there is one word to describe O/F racings team this year, it would be "Determined." The first race of the season ended with a gratifying second place. Over the winter, we made many changes to the car, and the car worked Great. The second race was the Vukovich. Last year we lost the Vuky after being spun, in the last 2 laps after leading the entire race battling Troy for 42 laps. Some say that was the best race they had ever seen. It was a heartbreaker, but O/F racing came back this year to take our second Vukovich trophy. On a side note... Jeff was racing a wingless sprint series between SMRA races, and won 4 of the events. Jeff's years of dedication and his winning spirit was really showing this year. The third Madera race was a real tough one. Jeff was leading the race when the radius rod bracket broke turning Jeff into the wall doing considerable damage to the car. We fought shock issues for 3 races before we actually got the car back to where it was drivable. The wreck had broken all four shocks. We sent the shocks back to the factory three times before they got the shocks set right. We had our only DNF of the season on this race. The forth race was Twin Falls. This is a track that Jeff has always been fast. The qualifying was so close between Jeff, Troy and Brian, it was almost unbelievable. Jeff went out and won his second Super modified race of the season. Jeff took a second place due to a miss that we later discovered was a bad coil. The fifth race was the Pombo in Madera. This was to be Jeff's 3rd win of the season. The next race was at Madera as well. Jeff got spun and sent to back while he was on the move. He finished 4th in this race. The last Madera race ended with a second place finish. We had the same hop we had been battling since the wreck. Somehow we just couldn't get back to the setup we had earlier in the year. We didn't get the Madera championship due to a very strange points structure. We did not know the Trophy dashes were a points race till the end of the season. Normally trophy dashes are for spectators, not for points. Jeff opted not to race a few of the trophy dashes. The last Madera race was the last scheduled race of the season. Then late in the year, a Vegas race was scheduled, giving Troy one last shot at the points championship. Jeff was leading the points race by 38 points going into Vegas. Vegas was a real nightmare. We had a miss on top, and could not figure out why. Jeff Qualified 9th quick. He ran a good race, but the motor just wouldn't run. Jeff still managed to keep Brian Warf and Troy Regier close, even though he was running on 7 cylinders as we found out later. Jeff finished 3rd. Jeff lost the championship based on a change of wording. The entire season the points structure was based on passing points. Then at the end of the Vegas race, they called it finishing points. Jeff started third and finished third, awarding him no points for the two different cars he started behind. Troy won the championship by 5 points. Wayne and Mike left Vegas the following Monday for Concord. They arrived in Concord Friday afternoon, unloaded the car and started to maintenance the car. Wayne found a broken valve spring while setting the valves. This explained the miss. Jeff had run the Vegas race on 7 cylinders. Once we fixed the valve spring, the car was fast...really fast. Every time we would go out for practice, they would come down and measure something, axle width, wing square inches, act. We could obviously see they were worried. Then they came down and said we had to run the tires they run. They run a 50 compound and we run a 2048 compound. The difference is practically non-existent. We setup the car in the shop to the rubber that was on it. Now they wanted us to change the rear tires just before the heat race. We understood it was a Shootout. They run their rules, we run ours. With the tire change we agreed to, our setup was not the same. The car was loose, loose, loose for the heat race. Jeff started the main event 2nd row inside. It was obvious early on that the motor wasn't pulling again. About half way through the race, the car started putting steam out the exhaust. We suspected a cracked head or head gasket. We inspected the car when we got back and found a rocker tower had broken. All and all...it was a great experience to be able to race with the east coast boys. We just wish the race had gone better. This was a tough year, but we still feel really good to have led the championship for the entire season. Jeff is still contemplating his intentions for next season. There are allot of things that need to be considered for next year. All of us at O/F Racing want to thank our Sponsor and our Fans for all your support throughout the years. It's been a Great ride.